Happy New Year guys! We have been given the privilege of seeing yet another year, and as with every New Year, 2016 has brought with it a flurry of ‘New Year, new me’ sentiments all over. Although very little is remembered after February, the general sentiment lives on. There is always renewed hope in a New Year. It’s a clean slate, a fresh new beginning and after the holidays we are charged up to take over the world, not only in our personal lives, but also in our careers. That is what I am excited about. 2015 was a wonderful year for a lot of Startups I interacted with. It saw many new comers in the field, with many more experiencing encouraging growth. How then, will 2016 look like for our tech industry? I have a few ideas, some things that I hope to see this year, but as we all know, humans always try to predict the future but we are almost always wrong, so do not hold me to my words. Digital migration in the Education sector. I will loosely take this term to mean the shift of our education sector from the ‘dark-ages’ of solely using textbooks and exercise books, to the ‘new-age’ of widely adapting digital media. In a mostly digital world, it only seems right to introduce our kids to the a world that we consume daily. It is not right for a child to get digital stimuli simply from their parents’ phones and tablets when playing games. There is so much more to do and so much that they can be with the right stimulation at the right time. Our classrooms should be digital. It is about time! Many people (both the government and private sector) know this and have made great strides in digitizing our classrooms. None, however has achieved a self-sustaining all-in-one solution. A solution that we can say can probably push us into the ‘new-age’. Well that was true until BRCK came into the picture. BRCK isn’t a new company. They have been in the scene for a couple of years and was mostly known for their rugged Wi-Fi router that is physically robust, able to connect to multiple networks and pack enough power to survive a blackout. They thought that more can be done for the African continent that they develop products for. Then came BRCK Education. They made a tablet, the Kio. I was I awe when the Kio tablet was unveiled. By itself it was impressive. This was a tablet designed for the kids in school. It is water- resistant, dust-resistant and able to withstand drops from a desk to a concrete floor. Kids would have to work extra hard to ruin this. Tablets in school are not a new thing. They exist and have been used before so other than the features the Kio tablet had, it was nothing new, just like Erik Hersman said to his team in the early stages of their product development. There had to be a holistic solution. Hence the Kio Kit. 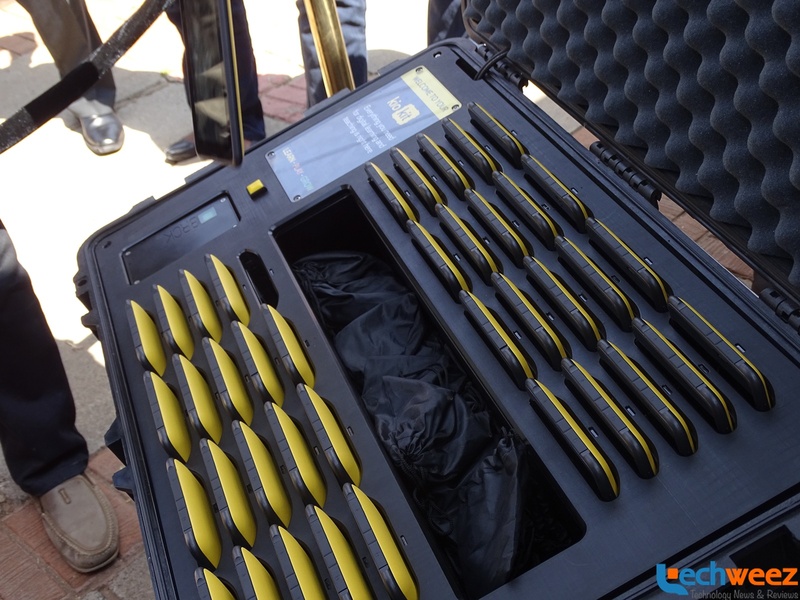 This is a rugged ‘suitcase’ that has 40 Kio’s in pouches that support wireless charging, has a BRCK + Raspberry Pi to act as a server and provide Internet connection to the classroom. The Kio Kit also has enough battery power to support the whole system for a normal 8 hour school day. What does this mean? Well, this all-in-one classroom solution is perfect for introducing the digital world to all kids from whatever background without the need for dedicated power or internet supply. They didn’t offer a solution to one problem, rather an easy to deploy solution to everything. Can you guess what this means to the education sector as a whole? BRCK have provided a solid medium to digitize a classroom. With a push of a button, a classroom instantly gets access to the digital world. You are no longer tied down to textbooks and past papers, you can explore and learn more outside your normal sphere. Curriculum can be made and updated on the go! It doesn’t matter if you do not have a physical classroom, all you need is that box and you are in. This is an environment where imagination becomes reality. In an age where we have to play catch up to the rest of the world, quick, smart solutions need to be made. If BRCK partners with the right people and better execute this solution in various ways in the sector, there is no telling where this could go. If a strong, seemingly reliable first step was needed, this was it. According to Erik, there is more in store, so maybe we will see that this year. For the sake of the kids, I hope so. When amateur doesn’t cut it anymore. Why be average? Why be amateurish? Our tech scene has seen great improvements over the past 5 years. With increase of both smartphone usage and internet penetration, our lives are moving online. The use of the smartphone opened up users to thousands of applications that let us achieve more than just call and text like we did not too long ago. A lot can be achieved using an app. Application development has grown strides all over the world with new languages and better design methods day by day creating better user experience. Not only has user experience and efficiency increased over the last two years, apps have become smarter and more in tune with our day to day lives. Anyone can teach themselves to write and design applications. It is an accessible field that is constantly changing and improving. Why then should we get stuck in the old design ways and app developing concepts that we learned 5 years ago? The idea that ‘if something is not broke don’t fix it’ is a lazy one. The thing that bothers me is that in as much as the Internet has leveled the playing ground for us with the rest of the world, we still lag behind in our concepts.We access the same media but for some reason only a few of us do something about it, the young. Somehow this makes it a good thing. Our young people are not afraid. They are excited and full of curiosity and ambition in creating something extraordinary. Amateur hour is over! AirKlip debut last year with a fantastic application for University students. It is beautiful, simple and functional. This was no surprise. This was an application developed by University students for University students who know what they need and how they need it. A lot of self-teaching was involved and it paid off. They didn’t accept to be just okay with that they learnt in school, they did more. With that spirit at the beginning, then it only goes to show that they can do more, not only the AirKlip team but also many other young like-minded people like them with awesome ideas which are well executed. I think they did more than just make an app, I believe they gave other young budding app creators motivation to do more and achieve more, to be better. I think that we will see more of this this coming year, fresh minds with beautifully executed ideas. Processes also needed a little update after some time, even simple processes as getting business cards. That’s what The Card Guys did with their web application. They gave us a different way of doing something that has been done the same way all over both online and offline. They changed the process, they saw a different way of doing something and it was refreshing. But they weren’t the only ones. KCB Group did the same thing with their mobile banking application. They took a process that seemed set in stone by all other banks and changed it for the better. They changed the way we should view and use something as crucial as banking applications. They changed the conversation from cold, robotic utility to friendly,warm companionship as the relationship with your bank should be. I do hope that we see more of this shift of thinking this year. This is what moves something from amateur to extraordinary. Newcomers are essential for the growth and sustainability of any industry, regardless of the level they enter from. New coders enter the tech space with fresh new ways of writing and executing code and programs. New mentor come in to groom those who a rough around the edges in order to help them become the best that they can be. New investors come in to show support and validation for new businesses. They give them a much needed thumbs up. New users come in and show the need for these businesses and what they offer. They give them purpose. This cycle continues day in day out. 2016 should not be any different. I believe we are ready to accept newcomers and grow or industry. Last year saw the entry of the Hong Kong based Nest VC into the African market through Kenya. Now these guys are special because of one key thing, they are ready to get down and dirty and actually do the work. Since they came in Nest has been involved in a lot of activities and projects geared towards better understanding our tech industry and providing the right space and support in growing it. They are dedicated to the idea of listening, teaching, advising and supporting all those companies that believe they have a future in what they do. This says a lot about our startup culture. The world is taking notice and they want a piece of it. Nest doesn’t just want to put their name on it and be recognized as such, I want to believe that they are up for doing more. They are there to give you that initial push and open you to a world of possibilities. They feel like they will be there in the long run. At the end of last year, Nest was there for Ongair as they bid to grow into the Asian market this year and if there is anything Nest knows, it’s Asia. I predict a lot of growth opportunities for Startups this year. For those who are willing to learn and work hard and find proper mentors in their journey, this should be their year. With entrants such as Nest and hopefully more who are willing to do the work with you, the future as they say, is bright. Ongair is on the right path and I believe with careful guidance and risk taking, they should be on their way to success. Asia is a big part of ‘the rest of the world’, I think they can handle this challenge fine. I cannot see the future, I can only hold some hope for it, dream about it. There is so much we can do, we are talented and we have the resources to build great things. I have seen a couple of things from people who hope to unveil them this year, and I can confidently say that I am excited. If you have something that you want to show us, that you want people to know about, feel free to share it with us!